Great photos. I had some ice cream yesterday. Take care. Hope you've enjoyed your weekend. I adore these photos of Lara Stone! oh i love autumn!! such great picks. : ) & i hope you have a beautiful sunday, darling!! Just stopping by from SITS. Love the look of your blog! So pretty and dreamy, love it! love your blog...you have a great Sunday as well. AND Lara Stone is such a Stunning Autumn's Allegory, "with a High content of Bewitching-ness" !!!! ps: I really like the caressing atmosphere of this pictures, delightfuly full of Dazzling softness . . .
nice post, check out my blog sometime. Love that W editorial so! Loved that editorial from W magazine, too! And I also love autumn because fall fashion is my favorite! Yayyy...love breaking out the cardigans and layers. And always love ice cream, no matter the season! Thanks for sharing a lovely post and beautiful photos. I agree, The Cherry Blossom does have an inspirational blog. 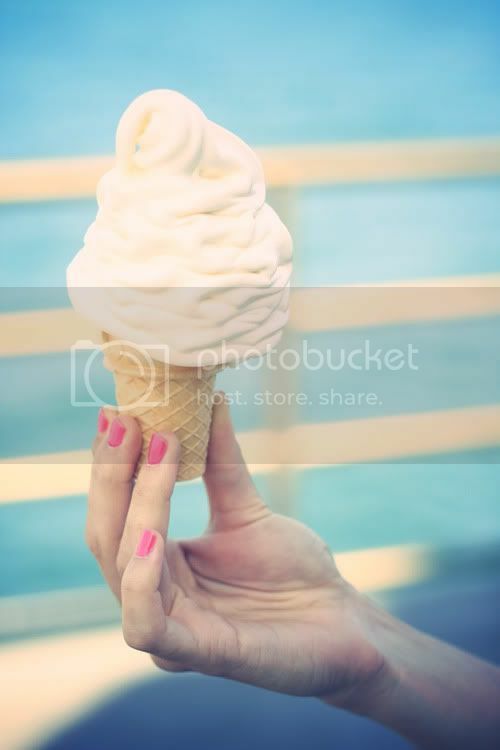 That icecream looks yummy and what lovely hands and pink nails, holding it. I'm wearing my summer dresses with my cardigans lots these days cos Spring is the perfect season for them too...ice cream is a must as well! PS: thanks for the birthday wishes! The make-up is what got my attention. Very much like Bridget Bardot or the Guess ads. I love fall dressing too. Wearing my high top boots with a cute floral dress & cardigan. sigh. Ice cream is certainly a year long treat, especially good in the colder months with warm brownies and fudge sauce. mmmmmm. Oh yeah, and how about vanilla ice cream with a little cognac over baked pears? word ver.- rocksto - haha, yeah baby, cause I guess I just roll like a rock star. this is such a pretty post - love the colors and the theme! I don't even eat ice cream but that photo made me want some haha! Great pictures! I agree, summer dress and cardis look so great together as a transition to fall! LOVE the photos!!! and definitely agree with the dresses with cardigans, my favorite!! Ah, I had not had ice cream like that forever. ;) Have a wonderful week Evi. Oh yes, I agree with you about fall and layering. Thank you so much for visited my blog and left such nice and kind comment. Those photos of Lara are beautiful! You've got me in the mood for ice cream now! Hehehe, almost summer down here where I live, so soon it will be bare legs and sandals here... cannot wait, of course I love ice cream, so summer or winter, does not matter, I eat it anyway, but the legs are a bonus... Lovely pics Eve. Thanks for swinging past my site and leaving your thoughs with us. omg that ice cream shot is AMAZING! Beautiful images and that ice cream makes me want to run out and find one exactly like that one. Hope all is well with you Evi and thanks for your sweet comments & stopping by this weekend! oooo totally obsessed with that first picture. omg, I love the ice cream photo so much. I can't wait to bust out the pretty knits! beautiful editorial photos... and that ice cream looks so good right about now! love the style of the first picture! I love Autumn in NYC...it is beautiful here! ...hey...I wanted to respond to one of your comments the other day...I totally believe what you wrote about glasses...I think your eyes can become more weak and dependent on the glasses....My youngest is only wearing them at school...then he takes them off at home...thanks for the advice! yes, cardigan season...i live for it! your blog is so pretty! this is my first time, and im in love haha. lovely images and really... lovely blog! fantastic pics - make me want to cosy up in warm clothes! your blog is BEAUTIFUL and wonderful!!! so glad i discovered it!!! Such a beautiful collection of photos! Swoon! The capelet and cuff are divine!! I'm happy you loved this post. And that ice cream is fantastic right?